On the event’s 90th anniversary this month, it seems only right to look back at the world’s first ever motel. The only way to travel prior to affordable automobiles, was by bus, train or ship. Considering the advent of mass produced cars at the turn between 19th and 20th centuries, combined with the improved development and true major production with much less cost created by Henry Ford and his Model T, travelers needed places to stay as they motored along the United States’ fledgling road systems. And where else might the eventual first ever motel pop up, than in California where highway and freeway travel would be become a standard for the world. 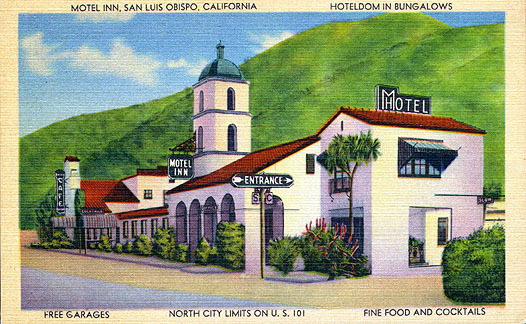 The simply named Motel Inn (originally called the Milestone Inn), was built in San Luis Obispo as a natural rest point halfway between Los Angeles and San Francisco. Businessman and architect Arthur S. Heineman, the owner, named it after his and his brother Alfred’s company name, Milestone Interstate Corporation, which was created as a venture to build motor courts up and down the West Coast. The early years of the Motel Inn. There were hotels and other temporary living quarters available to travelers including encampments, but nothing that truly accommodated tourist, vacationers and their cars. Also, the attraction of a more feasible way to lodge, made the idea grow. Thus, the ‘motor hotel’ was formed to meet the need. 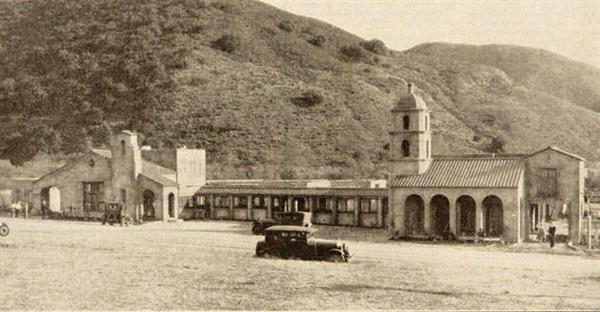 Also known as the Milestone Mo-Tel, the red-tile roofed facility opened on December 12th in 1925. Built on the Camino Real and Highway 1, a traveler could park his car in a garage and slip comfortably into a nice and clean white stucco two-room with kitchen bungalow that slept at least four adults. A buck and two bits ($1.25) would pay for a nights stay. 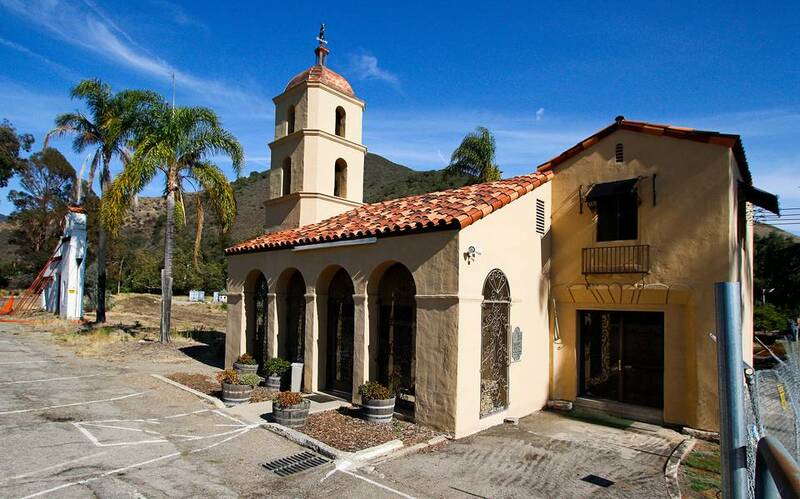 Comfort and convenience on the cheap – in the beautiful setting that is offered on the California Central Coast. The Roaring Twenties were in full swing and Heineman’s creation would appear to hit it out of the park like a Babe Ruth home run. However, he wasn’t able to find the financing for a proposed chain. Competition, the 1929 Crash and subsequent Depression nixed any expansion plans afterwards. What’s left of the Motel Inn in San Luis Obispo – circa 1990. Having changed hands several times over the years, the Motel Inn closed in 1991 and very little remains of the historic motel other than souvenirs at what now is the Apple Farm Inn right off U.S. 101 and Monterey Street. Earlier this year, there was a proposal by a couple developers to resurrect a newer version of the Motel Inn. 10 years prior another proposed concept to revive the infamous motel never left the drawing table. Airbnb notwithstanding, having just traveled by car this past Christmas reminded me of the vast array of hotels and motels still being used with no end in sight. Mr Heineman’s vision was ideal but maybe – as many pioneering businessman find – his timing wasn’t right. Whether the Motel Inn ever is brought back in some renovated form is not as important as the endearing and iconic accounting it brings to the history of automobiles and travel. This entry was posted in Business, Central Coast, History and tagged Arthur S. Heineman, Milestone Inn, Milestone Mo-Tel, motel, Motel Inn on December 30, 2015 by PasoDr.